An evening of performance and academic presentation. 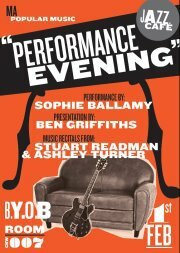 Opening the evening will be Songwriting & Composition student Sophie Ballamy, performing an acoustic set of her own beautifully crafted original material. In between the music will be Popular Music Studies student Ben Griffiths, with a presentation entitled “Take The Power Back” – a theoretical cultural study of Rage Against The Machine reaching the Christmas number one in 2009. Finally Stu Readman & Ash Turner will be performing a recital of a wide variety of jazz fusion material, amongst other genres. Both are highly competent musicians and this is a fantastic opportunity to see the two in full flow! This is a free event, and there is the opportunity to bring your own alcohol (within reason). All are welcome.